So here it is, my first oil painting in well over 10 years. 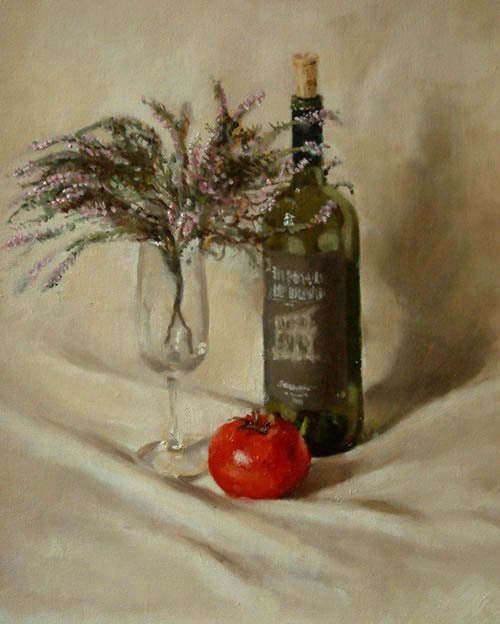 I like this painting because all the objects have some personal significance.The heather I proposed to Michelle with on the North Yorkshire Moors in August.The wine bottle is Vino Nobile de Montepulciano, brought back after a holiday in Italy. We drank quite a bit of it over there. The tomato is because we ate so many tomatoes in Tuscany, they were the best we’d ever tasted. Big, ugly, lumpy red/yellow plum tomatoes picked fresh and full of juice. Thats not one of them, its a stunt tomato purchased from Waitrose. Round, perfect, uniform, tasteless. That holiday got me inspired to start painting again. It was the Tiepolo paintings in Venice, and it was meeting Robert Michael Shaw, an American ex pat painter who had an exhibition in Cortona, where we spent four days. I went back to see his exhibition every day and chat with him. It was inspiring to see a guy who just happened to be there, painting full time and apparently getting by pretty well. I can’t say this first attempt exactly blows me away. I suppose I was feeling my way, not sure how it was going to turn out. It was roughed out with turps thinned raw umber, then painted an object at a time, bottle first, heather last. I didn’t use any medium, and the only really opaque paint is on the tomato and the flowers on the heather, all the rest is thinned with turps. The bottle was looking pretty good until I filled in the heather and the highlight got lost. I remember thinking that I must have got the relationship between them wrong. The back end of summer 2005 was a good time for us, I think I’ll put this on the wall to remind me of it.